In order to explain this mysterium, one must make a trip into the history of the Jazz guitar: The Archtop Jazz guitar was invented and conceived by Orville Gibson and perfected by his technician Lloyd A. Loar. The first Archtops were Gibson guitars of the model series L-1 to L-4, built between the turn of the century and approximately 1930, with round or oval sound holes and carved top and back. 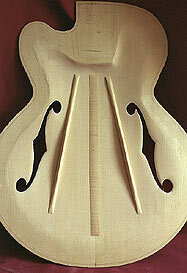 The top had to be reinforced against the string tension and to achieve this Orville Gibson introduced a system of two bars, glued in parallel underneath the top. But since the sound hole was cut into the top at the end of the fingerboard, the most reasonable arrangement was to use a system of two cross braced bars, supporting the top left and right side of the sound hole. When Lloyd Loar introduced the new archtop model L5 to the market in 1924, a new possibility for a bar system arose as a result of the new arrangement of the sound holes, which now were shaped like violin f-holes and cut into the top laterally to the bridge. Now a system of two paralell bars could also be glued to the top, running in between the f-holes. Initially Gibson used both bracings. But after about 1940 the Gibson company preferred the parallel system and starting shortly after the end of war Gibson exclusivley used the paralell system. Finally there was still another company, which used a third system: The Boston based company of Stromberg. This manufacturer built guitars, which had only one beam underneath the top. This was diagonally positioned. In the course of the history of guitar building however the parallel system was given advantage to the cross braced. Other manufacturers such as John D'Angelico or Epiphone always used both systems. D'Angelico e.g. constructed his guitars to the needs of his customers. And thus we are now on topic: Which sound differences arise as a result of the two different bracing systems? Basically the reason it is quickly avowed: Due to my experience a brighter, finer sound results in the case of a parallel bracing, while a cross bracing gives rather a more mellow, perhaps also somewhat darker sound. These differences arise as a result of the fact that the top becomes stiffer with the use of a parallel system. While the top is softer with the use of a cross system. Thus we have the rule of thumb: The more rigid the cover is, the more brightly becomes the sound. But that is, mind you, only one rule of thumb. Because there still are many factors that affect the sound added when building. These must also be considered by the guitar maker.